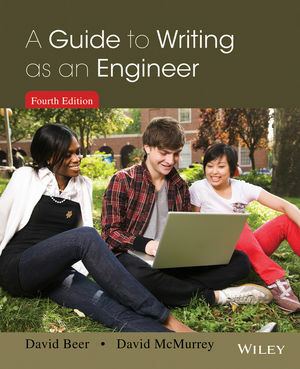 The fourth edition of A Guide to Writing as an Engineer updates Beer and McMurrey’s popular book on communication and technical writing for engineers. Used predominantly in freshmen engineering survey courses, the text is also applicable for specific courses on engineering writing or technical communication later in the curriculum. A Guide to Writing as an Engineer deals with a variety of topics ranging from important writing concepts that apply to professional engineers, to content, organization, format and style of various kinds of engineering writing. The book also covers oral presentations, research techniques, ethics, and proper citation methods. Beer remains a practical, handy book that can function not only as a classroom textbook, but also as a reference and guide for writing and research, for practicing engineers. David Beer is a retired professor of Engineering Communication at the University of Texas Austin. David McMurrey is Business & Technical Communications department chair at Austin Community College; a former technical writer, editor, and vendor coordinator for IBM-Austin; and a writing seminar provider for engineering groups at state and federal agencies. Incorporates new coverage of Social Media in a chapter written by Jill Brockmann of Austin Community College, including popular emerging forms, discussion of best practices, dangers/ethics of using social media, and “noise” in social media. Updated content and revisions. Chapter 8 has been substantially revised to address the emergence of search engines and provides a set of guidelines for evaluating sources and proper citation methods. The Informal Communication section in Chapter 9 has been expanded to address “oral informal communication” within a cultural context. Boxes added in each chapter summarizing an interesting, new technology and/or device. Stories added abouthistorical and modern day technical failures, as prompts for student reports and projects. Introduces the concept of noise in communication rather than focusing on errors and poor writing, as in traditional courses, alleviating negative feelings students have about the writing and revision process. Examples from real engineering writing that concentrate on the engineering discipline and the specific area of focus that the student is studying and will be practicing as a professional. Coverage of ethics—Presents two different Engineering Codes of Ethics (IEEE and ABET) showing how engineers and/or student interns can implement these codes on the job if faced with an ethical decision. Shows how to document information taken from other sources by providing examples of numerous kinds of sources.